Gothic Funk Press, 9780989920223, 122pp. Two twins born to an ex-autoworker and a forest spirit seek their place in the world. An aging widower sets out on a journey through time and space to reunite with his wife. An eccentric billionaire destroys human civilization by causing the earth to rotate from north to south. In this collection of thirteen essays and short stories and thirty pieces of flash fiction, Flint-based author Connor Coyne explores the surreal, the macabre, and, above all, the poignant transience of life in a world that seems to change before our very eyes. The whole collection is bookended by meditations on one of Flint and Michigan's most enduring gifts to the larger world: the Flint-Style Coney Island. The title and cover are an homage to the Atlas Coney Island Restaurant, itself a longtime Flint institution. General Motors may not be making nearly as many cars there as it used to be, but there is no better place to eat encased meats topped with more meat. 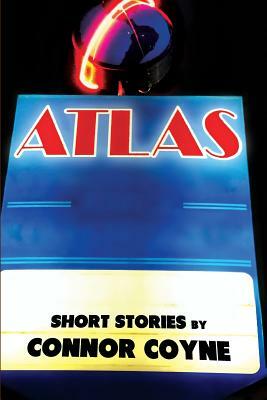 Atlas features selections written between 2006 and 2015. Some selections have been previously published in journals including the Santa Clara Review, Moria Poetry Zine, the Moomers Journal of Moomers Studies, and elsewhere.